Let the Amish Jacoby Work Table Desk provide the work space you're looking for in your busy office. This beautiful solid wood work table gets right down to business providing you with the space you need and a style you'll love, not to mention a durability that will last for years! This work table is long and slender and ready to support you as you spread out projects and set up your computer station. Legs are thick and tapered ever so slightly to provide a graceful form for your home or business office. The Jacoby is shown here in rustic cherry wood with Michael's cherry stain. We are delighted to offer six wood species for you to choose from as well as rustic versions should you choose. Completely customizable, this work desk comes in several sizes to fit your space. Choose to have a keyboard tray built in with a padded wrist rest to keep you comfortable as you work. 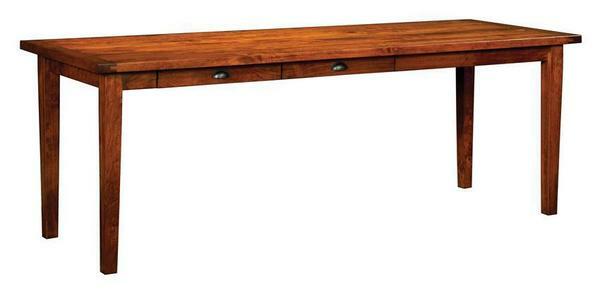 You also have the option for having a desk top that is smooth and solid or a planked top with breadboard ends. Invest in a work table that works for you! This Amish office furniture will not have to be replaced, saving you money in the long run. Please call us today with any questions about the Jacoby or visit our DutchCrafters Furniture Store in Sarasota, Florida to experience Amish made furniture in person. We can be reached toll-free at 866-272-6773. Floor to Bottom of Skirt: 25 1/2"